August 1, 2011 In the last monthly report, Portland mentioned that the exploration for oil from tar sands was controversial. This seems to be the general view, but why? Also, why has it taken so long to find out that the tar sands can be used to produce oil? This is a hot potato and will probably get the tar sands lobby on our case! But here is what we believe to be a balanced view on the subject. The exploration for oil in the Canadian tar sands makes eminently good sense in the current economic climate. After all, every piece of analysis points to a long-term supply shortage versus crude oil demand. Therefore, any rich source of oil supply is inevitably going to be explored. However, tar sands exploitation is a very messy business and has a fairly poor environmental track record. Giant tar lakes have historically scarred the landscape, polluting rivers, affecting fish stocks and destroying flora and fauna. Such pollution can, and should of course, be contained and increasingly, stricter controls are being enforced by the Canadian Government. However, there is no getting away from the fact that producing oil from tar sands is tremendously energy intensive and generates significant carbon emissions – much more so than conventional exploration for oil. This is essentially because tar sands contain more impurities (tar sludge, metals, rock etc) than conventional oil and all this has to be removed through industrial processes before the product is ready for refining. This energy intensity issue answers the second part of your question with regard the “discovery” of the tar sands oil reserves. The oil has always existed and oil companies have always known this. However, because of the energy required to extract and prepare tar sands, the cost of exploration has up until now been largely prohibitive. As a rule of thumb, the crude oil price has to be in excess of $75 per barrel for the tar sands to be commercially viable. So with prices now sitting around the $100 barrel and few analysts predicting much of a dip in this price, the tar sands are receiving serious investment and exploration. July 29, 2011 Why is there still a $22+ difference between Brent and New York oil prices, and when do you think this gap will close? This goes back to an earlier question in the forum (see Feb 2011) and our answer still holds true. The New York price you refer to is most likely West Texas Intermediate (WTI) – the marker grade for US crude sales and we believe the difference between that and Brent, looks set to stay in place for quite a while. In the past, WTI used to command higher prices than Brent, because a) it was a sweeter crude able to produce more petrol and b) it served the largest oil market in the world, ie, the USA. Since then, as we know, times have changed. There is no longer a premium for petrol producing crude oil grades (in fact the opposite) and the US economy is stagnant to say the least. Furthermore, the WTI price reflects the record breaking stock levels in the States (high) that do not reflect their low demand, thus resulting in a relatively suppressed price. Brent on the other hand produces more Jet and Diesel (the big growth grades) and serves the whole of the world outside of the States. Clearly the rest of the world market (ie, India, China, South-East Asia) is far more buoyant than the States and the Brent price reflects this. So in a nutshell, Brent is now seen as the de facto marker grade for the world and we see the large differential as long-term. July 22, 2011 In your answer to June's Fuel Forum question, you mention the impact of commodity speculation on oil prices. Truthfully, what is the impact of speculation? Is it greater or less than popular perception? Using the word truthfully makes you sound like our Mums! The truth is that speculators can only ever fan the flames of a commodity boom or bust. This does not underestimate their impact, but simply means the conditions have to already exist, such that speculators can profit and therefore affect market movements. The thought that speculators can push prices up to the levels that we have seen recently, flies in the face of world economic data, ie, that demand in places like China and India is in danger of running away from supply. A more relevant factor to note is the general access to oil markets that now exists. It was only as recently as the early 1990’s, that oil markets were the business of just a select band of oil companies. Banks weren’t on the scene, let alone hedge funds. Clearly, this was an unsustainable position and one that lent itself to accusations of price fixing and collusion. So the markets were opened up and suddenly a whole world of people who didn’t really understand the fundamentals of oil, were pumping more and more money into the market. The unintended consequences of this development were inevitable distortions in the market, that did not reflect the actual fundamentals of supply and demand. For example, the suspicion that a hedge fund will be buying $billions of forward contracts, will often have an equivalent short-term impact to an oil field closure or discovery. So it is a complex picture, but business cemeteries are full of companies and people who thought they were bigger than the market itself. The truth is that no-one can “corner” a market as vast as oil, so in the long-run, supply and demand will remain the main price drivers. July 21, 2011 Of the 9,000 petrol stations in the UK, what percentage sell Tunnock's Tea Cakes? And does Portland believe regulation should be introduced to make their sale mandatory across all forecourts? We couldn’t say this was an area of particular expertise for us Mark, but we have contacted the British Federation of Teacake Retailers and they don’t exist. So we can only surmise that Tunnock’s Teacakes (or equivalent) can be purchased at all petrol retail sites in the UK. With regard regulation, we generally oppose red-tape and feel that forcing tea-cake sales might take the biscuit (…sorry!). June 7, 2011 I was really interested to read May's Oil Market Report and see the biggest drops in diesel price over the last 20 years. Do you have a similar graph, showing the biggest movements in price either up or down? Your wish is our command Finley. The attached graph showing the biggest movements in the price of diesel in the last 20 years. Readers of the May report will once again note that all the biggest movements in diesel have occurred in the last 10 years. As the May report stated, much of this is due to the high price of fuel, which means that swings in price have higher absolute values (ie, a 10% movement on 20ppl is 2ppl, whereas at 50ppl the same swing is worth 5ppl). However, the fact that the boom in commodity speculation coincides with this last 10 year period, does little to remove the suspicions of conspiracy theorists who feel that market manipulation is behind fuel price volatility. The other interesting point to note from the graph is not so much what it shows, but the events that fail to feature. Traditionally viewed “game-changing” price shifts, such as those following 9/11, do not even make an appearance. Nor does the first or second Gulf War, or indeed the “massive increases” post Hurricane Katrina (as the press at the time reported them). It is a strange world indeed when “tension on the Iraq-Turkey border”, impacts the oil markets more than an event that knocked out 40% of the US’s oil production capacity. 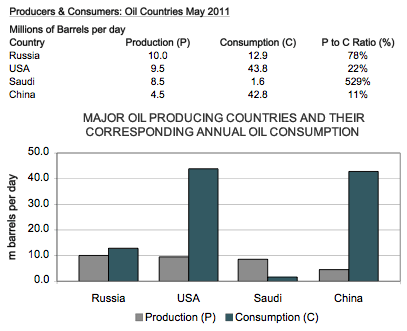 April 5, 2011 A work colleague told me that America produces more Crude Oil than Saudi Arabia. Surely this cannot be correct? Your colleague is correct – allow him / her an extra visit to the office biscuit tin. America does produce more oil than Saudi Arabia, but it is also uses more oil than Saudi by a huge factor. Therefore, the US not only produces huge amounts of oil for its own consumption, but also heaviliy relies on imports, most notably from Saudi Arablia. So Saudi Arablia is actually the biggest exporter of oil in the world, but not the biggest producer. Saudi’s large exports are in part a result of its huge reserves, but equally a function of its low population / low internal demand. So credit to your colleague, but perhaps you could snap the biscuit tin shut on his / her fingers with this fact; Russia is the biggest oil producer in the world and this is illustrated on the attached graph. Also interesting to note on the graph is just how reliant China is on foreign imports of oil (far more reliant than the US) – they consume almost 10 times the amount of oil as they produce.